APPEARANCE: Jikininki are ghouls which feast on the bodies of the dead. They appear as ordinary humans for the most part, except their features are more monstrous. They have sharp, pointed teeth which they use to peel the flesh off of the recently deceased. BEHAVIOR: Jikininki are found near villages, usually in abandoned temples or old ruins. They avoid excessive contact with humans, but remain close to human settlements, as humans are their main source of food. Jikininki gain their sustenance by devouring the flesh and bones of the recently deceased. They do not enjoy their existence and do not find pleasure in eating the dead. It merely temporarily relieves some of the pain of their eternal hunger. Jikininki exist somewhere between the living and the dead. They exhibit some ghost-like traits; they and their dwellings are often invisible during the day, appearing only to unsuspecting travelers during the night. They usually hunt their prey at night as well, slipping into temples when the dead are lain there for funerary prayers. 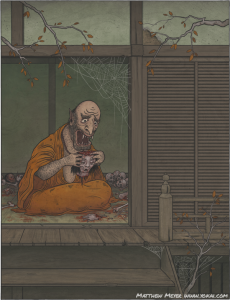 ORIGINS: Jikininki are closely related to gaki—hungry ghosts of Buddhist cosmology who are constantly starving but unable to eat anything. A jikininki is born when a person performs evil deeds, corrupting his soul. 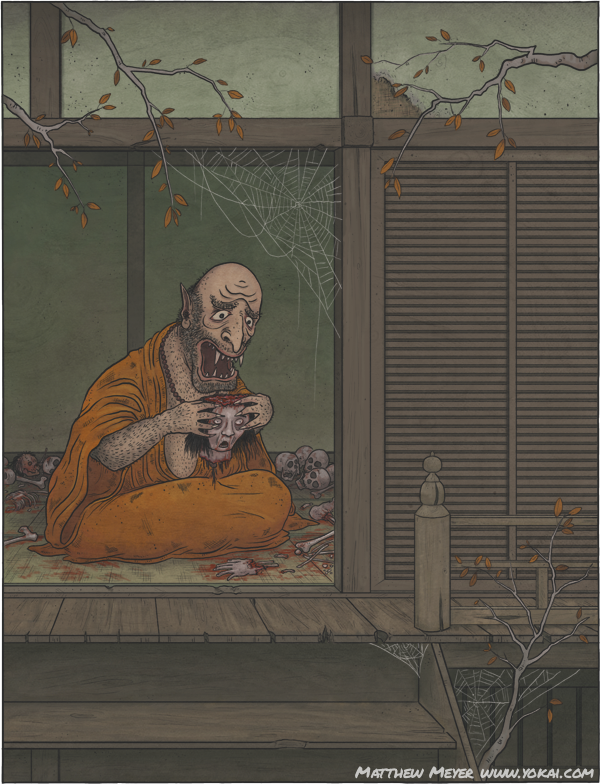 Some jikiniki were corrupt priests who could not properly pass on after their deaths. Others were once humans who, for some reason or another, developed a taste for human flesh. As time went on and they continued eating people, they gradually transformed into these monsters. LEGENDS: Long ago, a monk named Musō Soseki was traveling on a pilgrimage when he became lost deep in the mountains. As day began to fade, he came across a dilapidated old hermitage, where an elderly monk gave him directions to a village not far away. Soseki traveled on, and just as night fell he arrived in the village. The son of the village chief welcomed Soseki and invited him to stay in his house as a guest. “However,” he said, “my father passed away earlier today. In our village, we have a custom. When one of us dies, we all must spend the night away from the village. If we do not do this, we will be cursed. But you are tired from your journey, and seeing as you are a priest, and also not a member of this village, I see no reason why you too must leave. Please feel free to stay in my house this night while the rest of us leave the village.” Soseki gratefully accepted. The villagers all left the village, and Soseki was alone. That night, the monk recited funerary prayers over the body of the village chief. All of a sudden, he felt a presence nearby. Soseki felt his body freeze up, and he was unable to move. Then, a dark, hazy shape crept through the house and up to the body. The creature devoured the remains of the village chief, and then slipped away as quietly as it had arrived. In that instant, the elderly monk and the dilapidated old hermitage both disappeared. Soseki was sitting on the dirt, surrounded by tall grass. The only feature nearby was an ancient, moss-covered gravestone.